^ Linzey, A. V. & NatureServe (Hammerson, G. & Cannings, S.) (2008年). 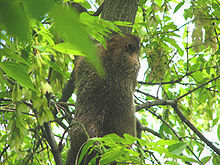 "Marmota monax". IUCN Red List of Threatened Species. Version 2008. International Union for Conservation of Nature. Retrieved 2009年1月6日. ^ Thorington, R.W., Jr.; Hoffman, R.S. (2005). "Family Sciuridae". In Wilson, D.E. ; Reeder, D.M. Mammal Species of the World: A Taxonomic and Geographic Reference (3rd ed.). Johns Hopkins University Press. p. 797. ISBN 978-0-8018-8221-0. OCLC 62265494. ^ Chapman, J.A. ; Feldhammer, G.A. (1982). Wild Mammals of North America, Biology, Management, Economics. Johns Hopkins University Press. ISBN 0801823536. ^ Woodchucks in Rhode Island. (PDF) . dem.ri.gov. Retrieved on 2011-09-15. ^ a b Owen, Lorrie K., ed. Dictionary of Ohio Historic Places. Vol. 1. セント・クレアショアーズ: Somerset, 1999, p. 328.